All restaurants recommended here practice good hygiene and food safety. I will only list those restaurants that take exceptional precautions in the preparation of their foods to protect their customers from gastro-intestinal infections. In other words, you can drink their water and ice and eat their fruits & vegetables! For directories of restaurants with websites and/or e-mail please see the Zihuatanejo Directory, the Ixtapa Directory and the Troncones Directory. Bananas - Unbeatable prices for breakfast! Delicious and carefully prepared meals. Fresh juices and fruits. Also a great place for lunch. Part of El Mango on Calle Nicolás Bravo in Zihuatanejo around the corner from the bank BANCOMER. 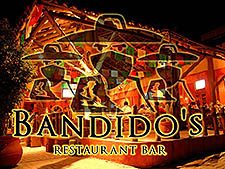 Bandido's - Mingle with the locals and enjoy refreshingly cold drinks and delicious Mexican lunches, dinners and appetizers in downtown Zihuatanejo on the corner of Calle Cinco de Mayo and Calle Pedro Ascencio across from both the church and the artisans handicrafts market. They feature live music and satellite TV sports. Beccofino - A wonderful marriage of Mediterranean and Mexican cuisine! Excellent seafoods and pastas in a romantic setting on the waterfront at Marina Ixtapa. Café Marina - Delicious pizza, pastas, sandwiches and other assorted special dishes. Be sure to check the Daily Specials! This is also the place to trade in or buy used books for your reading pleasure from their ample selection. Located in downtown Zihuatanejo on the waterfront next to the town plaza and basketball court at the Casa Marina. Carmelita's Café y Restaurante - Internationally acclaimed restaurant with open-air dining serving breakfast lunch and dinner. Located in Zihuatanejo on Avenida Heróico Colegio Militar on the corner with Calle del Cartero. Open daily from 8:00 a.m. to 4:30 p.m.
Casa Arcadia - Attentive service and specializing in delicious fresh seafood at affordable prices, located on the beach in downtown Zihuatanejo next to the garden known as "Plaza del Artista". A magical place to enjoy the view of the bay. Serving breakfast, lunch and dinner daily from 8:00 am to 10:00 pm. Casa Morelos - Delicious 100% fine Mexican cuisine. Specializing in seafood dishes of Guerrero. Located in the La Puerta Shopping Plaza in Ixtapa. Coconuts - One of Zihuatanejo's landmark restaurants located in a historical building offering fine cuisine, courtyard dining, a friendly bar, and frequent live entertainment as well as cultural events. Deborah's Restaurant (formerly Mamma Norma & Deborah's) - Homemade Mexican delicacies including fresh seafood, pastas, and vegetarian dishes among other specialties at this oasis of a restaurant fronting Ixtapa Boulevard across from the Holiday Inn in La Puerta shopping center. Open for breakfast, lunch and dinner. El Cafecito - They offer shakes, smoothies, salads, crepes, pastries, juices, and a variety of coffees. Located in Casa Marina near the gazebo at the Cancha Municipal (main plaza) in Zihuatanejo. El Mexicano Chili Beans - A delightful restaurant on Ixtapa Boulevard featuring homemade chili and assorted Mexican dishes as well as standard fare of burgers for those who must. Open for breakfast, lunch and dinner daily. 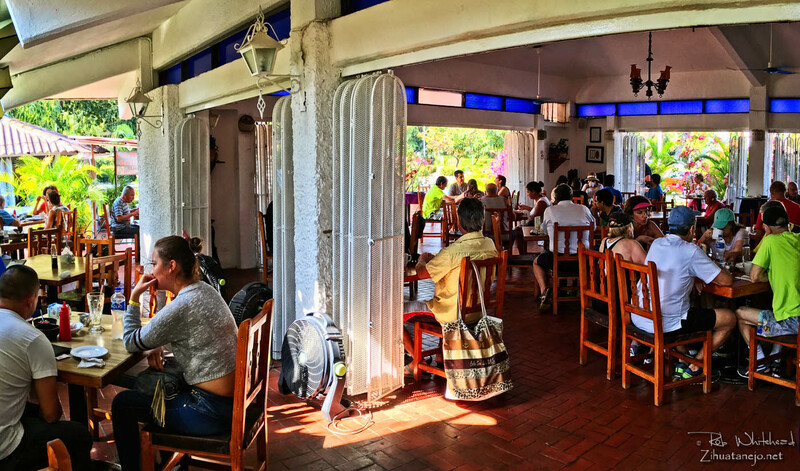 El Profe - A longtime popular pozolería located in Coacoyul, open Thursdays only from around 12 to 5. If you're heading south from Zihuatanejo on the Carretera Nacional 200 turn left (north) at the corner of the "Farmapronto" pharmacy. El Rincón Café - They offer a variety of prepared coffee as well as desserts and sandwiches. They also sell their excellent coffee from the sierra of Zihuatanejo ground and whole bean. Open every day. Located on Calle Hermenegildo Galeana between Calle Ejido and Calle Nicolás Bravo near the corner of Calle Ejido in downtown Zihuatanejo. Espuma Mediterráneo - A picturesque restaurant located on the scenic road to La Ropa across the street from its sister restaurant Tentaciones that overlooks Zihuatanejo Bay from a dramatic cliffside perch. Specializing in fine Mediterranean-style cuisine lovingly prepared by an Italian chef. Open for dinners only. Reservations are recommended. Fonda Doña Licha - A popular economical restaurant with home-style regional dishes including Pozole Thursdays. They offer breakfasts and lunches including an economical daily special known as a comida corrida. Located in downtown Zihuatanejo behind the municipal market on Calle Cocos #8, Centro. Open daily year round from 8:00 a.m. until 6:00 p.m.
Fonda Suzy - Economical and well-prepared breakfasts and lunches. A local favorite. Find their small restuarant in Zihuatanejo on Calle Nicolás Bravo about mid-block between Calles Vicente Guerrero and Benito Juarez. Fragolino - Italian-style gelato (ice cream) in over 40 flavors made with all natural ingredients. Located in La Puerta Shopping Center in Ixtapa, on Calle Ejido near the corrner of Benito Juárez and on Calle Juan. N. Álvarez across from the Plaza Municipal in Zihuatanejo. Inn At Manzanillo Bay - Fine cuisine by the waterfront in the restaurant of this unique Bed and Breakfast located on the beach at Playa Manzanillo near Troncones. The Chef/Owner is a graduate of the California Culinary Academy and has been featured in AAA Magazine's dining guides, Outside Magazine and the Culinary Academy's Alumni Cookbook Series. Jugería Carmelo's - Fresh juices, licuados and quick delicious breakfasts located at stall #23 in the Mercado Municipal de Zihuatanejo. Open daily. La Condesa - Enjoy fresh seafood and cold refreshments under a palm frond-covered ramada on the beach next to the lagoon at Barra de Potosí. Relax in their hammocks and enjoy your meal with your feet in the sand. Located just past the village, first restaurant on the far right (the first in the series of beachfront restaurants). La Hija del Capitán - Located in downtown Zihuatanejo at Calle Nicolás Bravo #39 above La Playa Bar. Specializing in delicious salads, juicy tuna steaks, tasty chicken wings, BBQ baby back ribs, tender 100% Angus beef steaks and hamburgers, and of course tempting desserts. All made with owner Tanya's secret recipes. La Perla - This beachfront restaurant at Playa La Ropa offers traditional Mexican and international fare including fresh seafood dishes. They serve breakfast, lunch and dinner daily and have a popular sports bar as well as a gift shop, clothing boutique, and walk-in humedor featuring cigars from Cuba. La Porteña Pizza & Grill - Although they serve delicious hamburgers and pizzas, they also have excellent cuts of beef, pork and chicken as well as fresh seafood prepared to perfection, all at reasonable prices. Located on the waterfront in downtown Zihuatanejo at Paseo del Pescador #37 in front of the "Plaza del Pescador" near the Apostadero Naval. Open daily from 2:00 to 10:00 pm. La Raíz de la Tierra - A vegan restaurant and café for dining and hanging out and enjoying a multicultural experience, project of the musicians Rodrigo y Gabriela. They have many incredible recipes including several that you won't believe are vegetarian, and they also offer free wi-fi. Located in "Plaza El Zócalo" in Ixtapa behind the movie theater. La Terracita - Serving delicious Mexican breakfasts and brunches, and during the high season from November to Easter exquisite dinners in a lovely open-air setting at the western end of Calle Adelita in Colonia La Madera within easy walking distance of downtown Zihuatanejo. Open year round from 8:00 a.m. to 12:00 p.m., and during high season from 6:00 p.m. till 10:00 p.m.
Los Braseros - Mexican fare including possibly the best tacos in town in many varieties. Serving breakfast, lunch and dinner. Open from 8:00 a.m. until 1:00 a.m. Located on Calle Ejido #26 in downtown Zihuatanejo. Mariscos "Galeana" - The most incredible seafood dishes fresh from the sea and prepared according to local custom. Find their restaurant on Juan N. Álvarez Street a little past the police module near the main plaza in downtown Zihuatanejo. Open daily for lunch and dinner. Nayito's - Enramada seafood restaurant at Barra de Potosí with a family atmosphere. Enjoy lunch and cold drinks in the shade of the palm fronds on the beach with your feet in the sand. Relax in a hammock for a siesta. The second restaurant on the right just past the village (next to La Condesa). Corona beer served here! Rossy's Restaurant - Long-time favorite seafood restaurant on the beach with palapas and sundeck located at the south end of Playa La Ropa on Zihuatanejo Bay. Rufo's Grill - This small open-air restaurant offers delicious dining under the stars at Calle Adelita #1 in Colonia La Madera in Zihuatanejo. Mexican cuisine featuring fresh choice meats and seafood. Located on the corner of Calle Adelita and Calle Nuestra Señora de los Remedios near La Ceiba Suites at the bottom of the hill. Serving dinners only. Closed Sundays. Tata's - Fresh seafood and regional dishes. Dine with your feet in the sand on the downtown beach on the Paseo del Pescador fronting the Playa Principal in Zihuatanejo. Panadería La Antigua - Mouth-watering homemade pastries and breads, located on Juan N. Álvarez between Calle Agustín Ramirez and Calle Cuauhtémoc in downtown Zihuatanejo. Beccofino Catering Service - Fine cuisine of Mexico and the Mediterranean available for all types of parties and events. Bandido's - Mingle with the locals and enjoy refreshingly cold drinks and delicious Mexican lunches, dinners & appetizers in downtown Zihuatanejo on the corner of Calle Cinco de Mayo and Calle Pedro Ascencio across from both the church and the artisans handicrafts market. They feature live music and satellite TV sports. Barracruda - A favorite local watering hole with cold draft beer and well-mixed drinks. Located on Calle Cuauhtémoc a half block from the main plaza (zócalo). Cohiiba Video Bar - Fun & lively meeting place and watering hole, located beside the Flamingo Cinema in Ixtapa. La Playa Bar - Popular hangout and sportsbar offering ice-cold beer (Corona, no Sol) and favorite spirits including mixed drinks. A great place to make friends and relax as well as to enjoy favorite sports and other popular programs via satellite TV. Located on Calle Nícolas Bravo #39 in the heart of downtown Zihuatanejo.